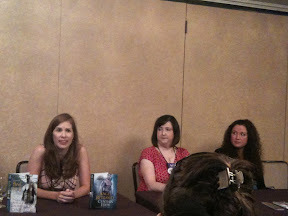 First day of Authors After Dark panels today. I happened to attend several panels Cynthia Eden was on (really, I went for the topics not to stalk her...sort of). It's so interesting listening to the authors answer questions about the writing process (what influences their writing, how they come about with their ideas, how they keep things research to keep things realistic, etc). They're so friendly, and it's fun talking to them - they're readers too who enjoy reading the same books that you also love who also happen to write some of the stories you love. The panels also introduces me to authors I have not read yet but will now go check out after hearing them speak about their book. I finally had a chance to get some beignets on this trip. 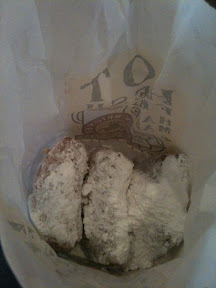 These are from Cafe Beignet, which is across the street from the hotel. It's been a while since I've had some from Cafe du Monde so I can't say whose is better but I thought these were pretty tasty. I ended up visiting Pat O'Brien's again - this time for dinner. I ran into Jen (@Twimom) in the hotel lobby and ended up tagging along. 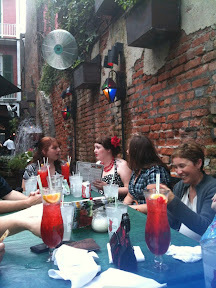 A huge group of us enjoyed some classic New Orleans drinks and foods. Here's a pic of part of the group at dinner. Calling it an early night tonight. We're going to be up late tomorrow to hit a burlesque show at midnight! Don't you love how how things just fall into place?! I was expecting to have a small dinner with one person and we end up eating with all those authors and tweeps. And I was so excited I started tossing knives! :-) It's been a great trip so far!! Yes, Jen! I thought I'd be eating alone since my roomies were busy but I was too hungry to wait for them. It was fun meeting everyone!